Where: Uffizi Gallery, ground floor in Aula Magliabechiana and 3 locations across the top floor of the museum. When: February 26 – May 26, 2019, open Tuesday – Sunday from 8:15am to 6:50pm, closed Mondays. Admission: €20 full price, €2 reduced for EU citiznes aged 18-25, free for all under 18 and disabled visitors. 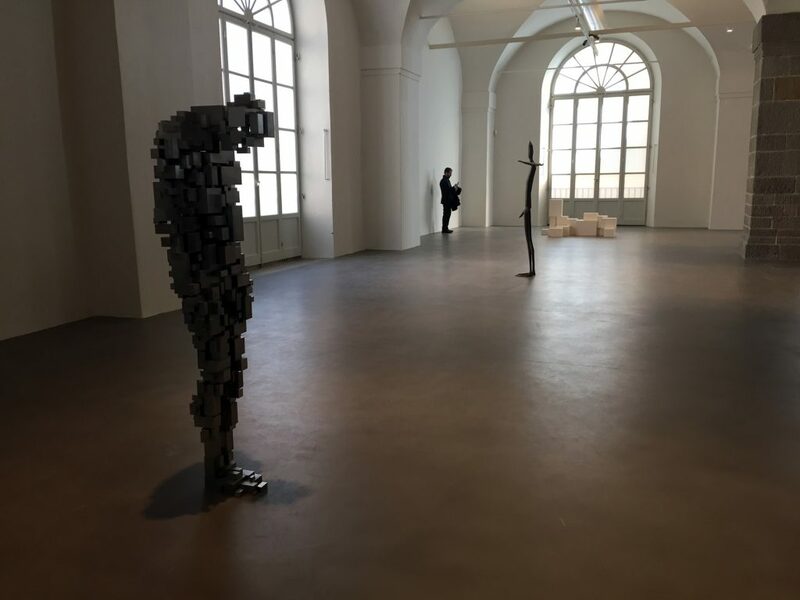 The new exhibition dedicated to Antony Gormley, a contemporary English artist, at the Uffizi Gallery opened up this past Tuesday and I was able to go see the spectacular works he has brought to Florence this year. He had another exhibition in 2015 in Florence, at the Forte di Belvedere, so his work is not new in Florence (did you see the last one?) but one of the exhibition’s central pieces, Passage, is surely the largest work ever shown at the Uffizi museum. In addition to Passage, the exhibition includes a selection of sculptures in various materials and in different sizes that span over 38 years, exploring the themes of the body in space and the body as space. The Aula Magliabechiana, the new ground floor gallery dedicated to temporary exhibitions located near the gift shops, is hosting 12 works. Here, the natural light plays with the 12 vaulted spaces defined by six stone columns and no internal walls to further enhance the pieces of sculpture of the artist. 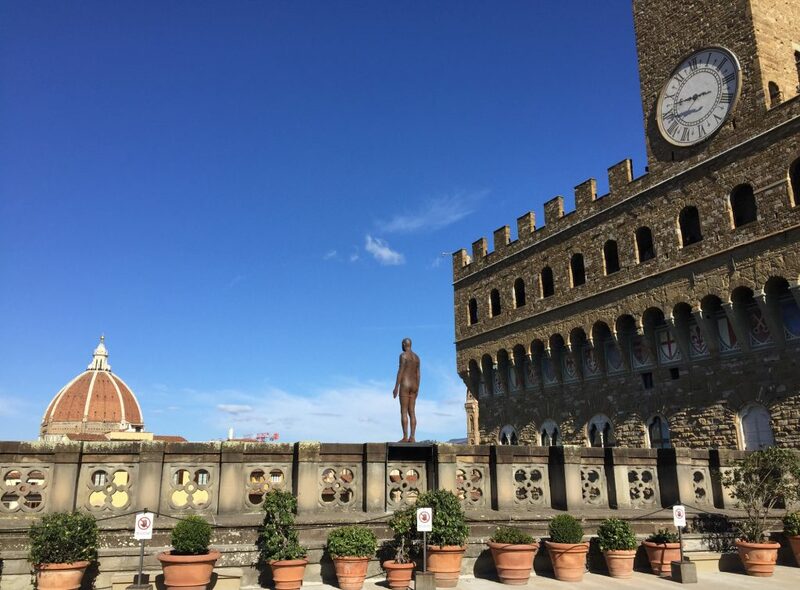 Another 3 are on the top (second) floor of the museum, with two in the context of the historic collection and one installed on the terrace/roof of the Loggia dei Lanzi looking out over Florence. I’d like to invite you to admire some of his works through this post, I won’t share ALL of them since I believe you should go and enjoy them all yourself when visiting the Uffizi this spring. I highly recommend you not skip it, especially since the main hall is at the end of your visit at the Uffizi. Ready? Here are some of the main pieces and ones I particularly like. 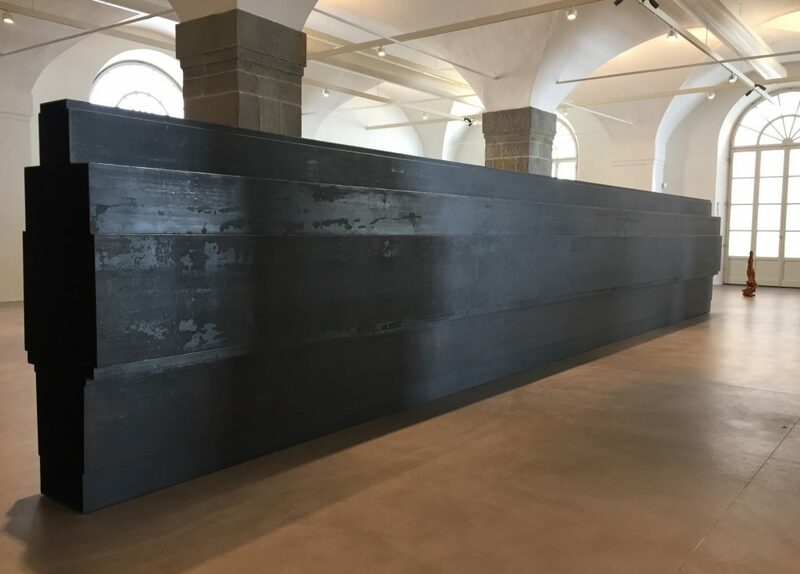 Passage (2016), 12 meters long, closed on one end and open on the other, the visitor is invited to enter into complete darkness, the only light being at your back. Above is Passage, a steel 12 meter long tunnel made in 2016 that is closed on one end int he shape of a body where you can walk into it. It is an interesting experience: in front of you, complete darkness, with the only light being behind. At first you are blind, until you turn around…. then you can walk backwards, if the darkness is too much. 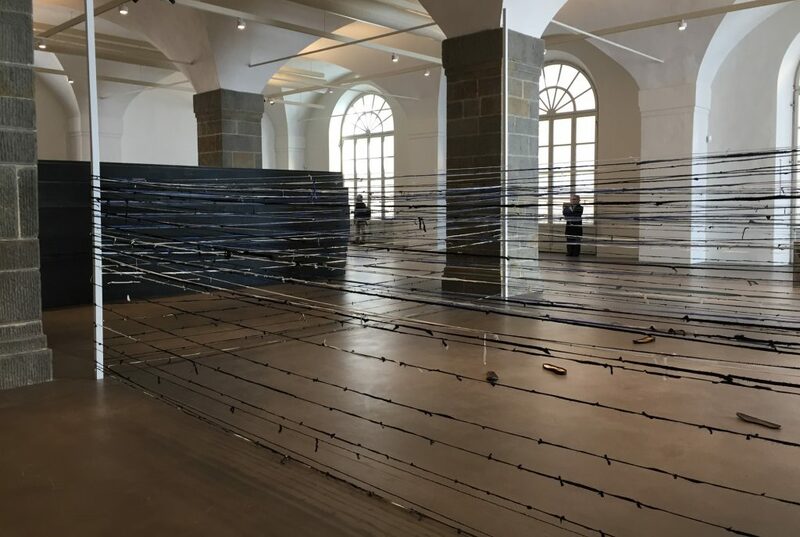 Right next to it, to the right, is Room (the oldest piece, from 1980), made up of the artist’s clothes cut into strips and joined to form a single continuous strip that defines a 6×6 meter enclosure, where you cannot enter. The show revolves around these two pieces, the dialogue between stasis and movement, imaginative and actual space. Which one attracts you more, at this moment in time? Room (1980): clothes cut into strips and tied, with socks and shoes strewn about, the body extended beyond the usual dimensions. I know most people don’t visit the Uffizi Gallery to see contemporary work of art, and not for sculpture (the Bargello is where you should head for that) but consider that Florence has always been at the center of inspiration and creation of representations of our world through the creative process. 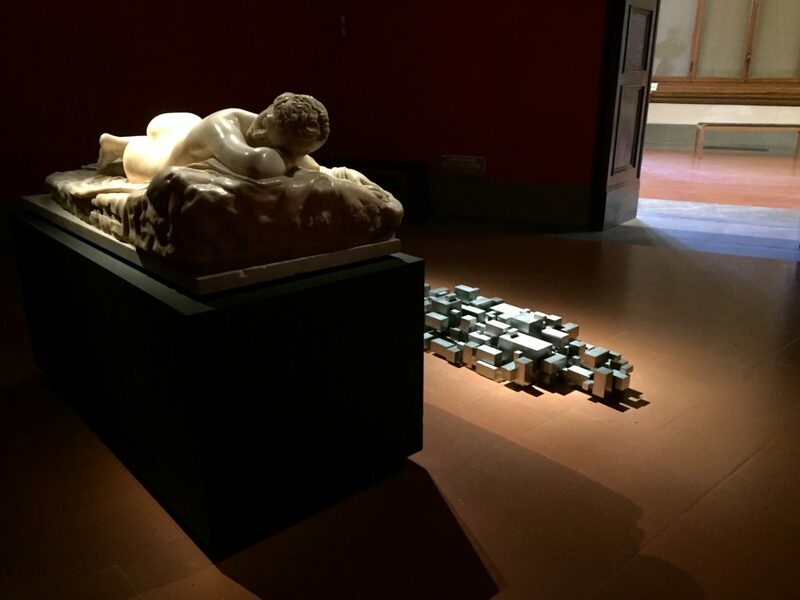 In particular, the 3 works found at the top floor of the Uffizi museum, two among the collections and one overlooking Florence, invite you to consider the interaction of the present us as a world with the past of Florence. Essere invites our active participation as connectors between defined objects and open space in which mass and void, dark and light, hard and soft engage the viewer’s presence in space. Antony Gormley, born in London in 1950, is widely acclaimed for his sculptures, installations and public artworks that investigate the relationship of the human body to space. 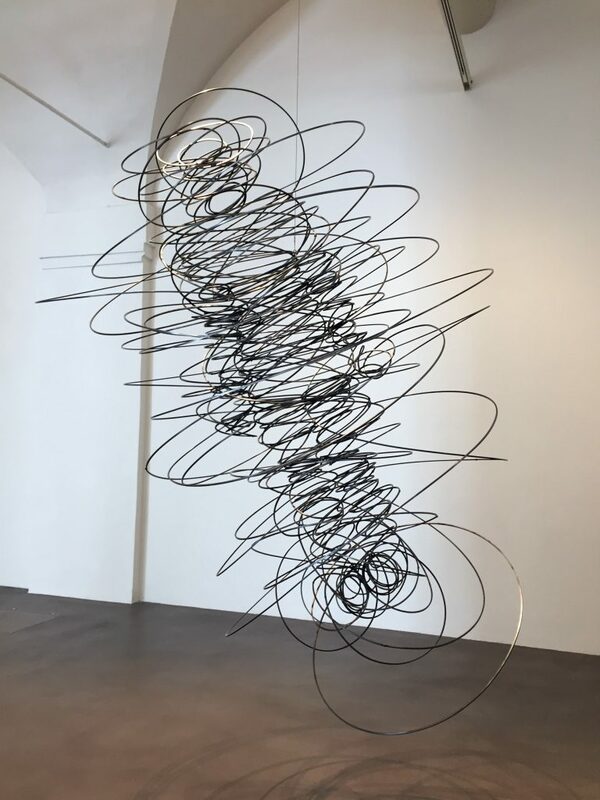 His work has developed the potential opened up by sculpture since the 1960s through a critical engagement with both his own body and those of others in a way that confronts fundamental questions of where human beings stand in relation to nature and the cosmos. Gormley continually tries to identify the space of art as a place of becoming in which new behaviors, thoughts and feelings can arise. Gormley’s work has been widely exhibited throughout the UK and internationally. He has had exhibitions all over the world, from Russia to Cambridge, Shanghai to Brazil, Germany and Denmark. A major solo exhibition of his work will be presented at the Royal Academy of Arts, London, in September 2019. Permanent public works include the Angel of the North (Gateshead, England), Another Place (Crosby Beach, England), Inside Australia (Lake Ballard, Western Australia), Exposure (Lelystad, The Netherlands) and Chord (MIT – Massachusetts Institute of Technology, Cambridge, MA, USA). 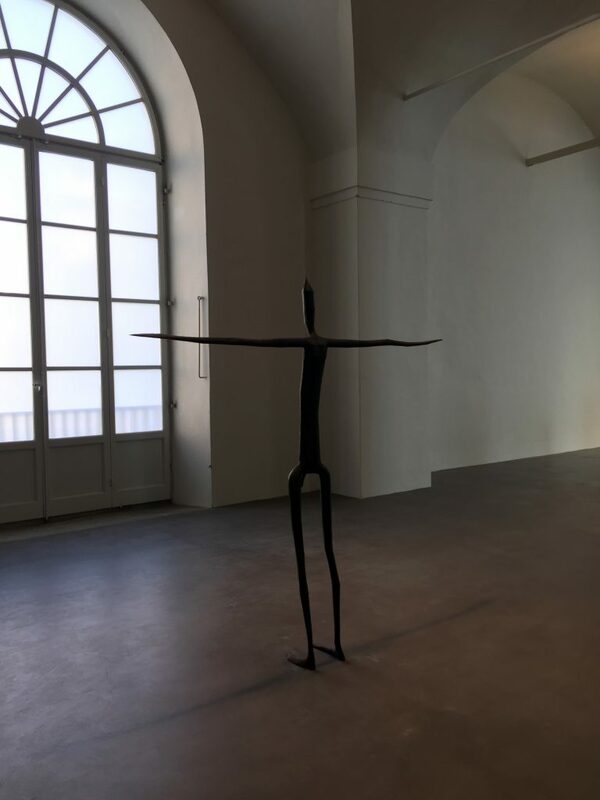 Gormley was awarded the Turner Prize in 1994, the South Bank Prize for Visual Art in 1999, the Bernhard Heiliger Award for Sculpture in 2007, the Obayashi Prize in 2012 and the Praemium Imperiale in 2013. In 1997 he was made an Officer of the British Empire (OBE) and was made a knight in the New Year’s Honours list in 2014, and been a Royal Academician since 2003. If you want to see more of Gormley’s work, visit his official page where you’ll find many photos of all of his work. Now, let’s get back to Essere at the Uffizi…. Feeling Material XXXVI (2008). A body in space, an infinite spiral, full of energy and transformations. Pile (2017). Solid pieces of clay. Photo is my composition of 3 views of the work on the ground so that you can get a better understanding of the pieces of clay. Both the steel sculpture of Feeling Material and the various pieces of clay on the ground assembled together to represent a body in Pile, photographed above, really speak to me. In my past, my creative self dabbled in ceramics and metal work to create some something quite similar, all in metal but with the concepts of both. In the various physical moves in my life, I am not sure what happened to my small sculpture or where it ended up but I remember it well. It had the elements of the body in the air as well as being grounded and enclosed. These two works remind me of those two sides of our selves, what I had envisioned in my own piece. Insider II above is what is at the core or residual that is left behind of the body, if we take away 60% of our body’s mass. It is quite haunting, could it be our soil before it flies away? Below are photos of some of the other pieces in the exhibition, I hope by sharing I have given you a glimpse into what you can admire up close if you visit Florence and the Uffizi Gallery between now and the end of May. 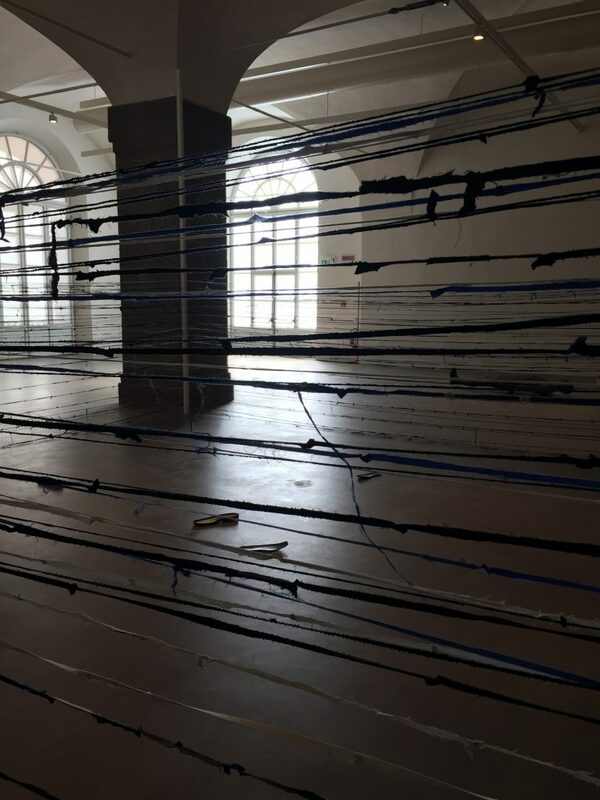 In the foreground, Loss (2006), with Insider II (1997) in the middle and Rest (2012) at the very far back (white blocks on the ground). Settlement IV (2018). Found along the second floor hallway in direct relation to the Sleeping Hermaphrodite, a Roman copy from the imperial age of a 2nd century BC Hellenistic original resting on a plinth. Event Horizon (2012) on the terrace of the Uffizi Gallery overlooking Piazza della Signoria. 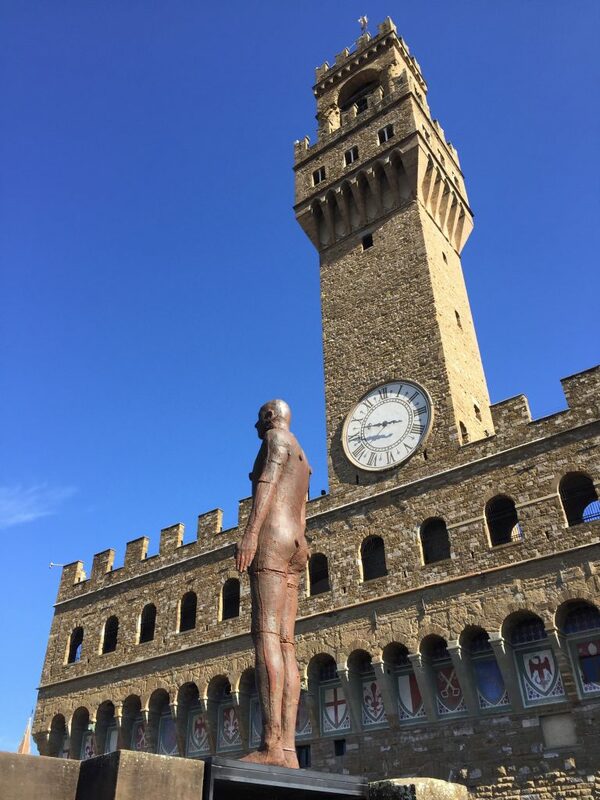 I purposely didn’t share the third work inside the Uffizi so that you can go see it, but it is similar to Event Horizon – a man looking over Ponte Vecchio – as opposed to this one looking over Piazza della Signoria and the Duomo in the distance. I hope you visit on a beautiful day like I did on this warm February day ;-). Event Horizon (2012) looking over Florence. Share your impressions of these contemporary pieces mingling with the Uffizi’s permanent collections – do you like it?